Map of Michigan, having numbering plan area 810 highlighted in green. Area code 810 is a telephone area code serving East Central Michigan. It includes the main cities of Flint, Lapeer, Port Huron, and the southern portion of the Thumb. More generally, it includes all of Genesee and Lapeer counties and portions of Oakland, Macomb, St. Clair, Sanilac and Livingston counties. Selected areas in north Oakland County areas of Oxford, Addison, Brandon, Groveland, and Holly are also partially served by 810. Area code 810 was implemented on December 1, 1993, and was Michigan's first new area code since 1961. It originally served all communities north of Wayne County that were part of area code 313, including the northern suburbs of Detroit. Only four years later, most of Oakland County was split off as area code 248. This led to a situation in which residents of southwest Macomb County could leave their area code area by traveling one or two miles westwards, but reenter it by continuing west for another 30 miles. 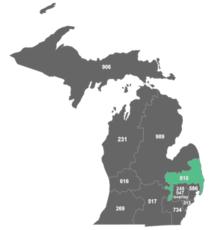 In 2001, when area code 586, including most of Macomb County, was split off from 810, only the northern communities of Macomb and Oakland counties remained served by 810. The 810 area code was one of three US regional area codes for the former AT&T TWX (TeletypeWriter eXchange) network, sold to Western Union in 1969 and renamed as Telex II. It covered Michigan, Ohio, Indiana and the US South (NC SC GA FL LA MS FL AL KY). The original TWX area codes were 510 in the US and 610 in Canada. The addition of 710 in the Northeast (New England, NY, NJ, PA, MD, DC, VA and WV), 810 from Michigan southward and 910 west of the Mississippi allowed each major city one or more local exchange prefixes in the special area code. The special US TWX area codes (510, 710, 810, 910) were decommissioned in 1981; Canada moved its remaining 1-610 numbers to area code 600 in 1992. Jimmy "B-Rabbit" Smith (Eminem) refers to area code 810 while free-styling as he fixes his car in the movie 8 Mile to insult "posers" who live in upperclass southern Macomb County suburbs (which were part of the area code in 1995 when the movie was set) instead of the lower income area code 313, which serves Detroit and Wayne County. The number '810', which is the area code for Flint, Michigan, the band's hometown, was used in the band name King 810 after they left Equal Vision. ^ Schafer, Joseph. "Violent pits, knife fights, and being shot: an interview with the notoriously violent King 810". Noisey.Vice.com. Noisey.Vice. Retrieved 5 February 2015. This page was last edited on 26 November 2018, at 00:01 (UTC).